In 2015 Dave left his role as Associate Professor at Beijing University of Aeronautics and Astronautics: it was time to put his money where his mouth is, to stop teaching game development and start living it. He returned to the UK and founded Dr Davient in 2016, taking his part-time passion full-time with Blockships - due for release this year. 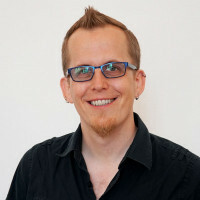 Dave holds a PhD in Computer Science from Newcastle University, with a research background in Mobile Ad-Hoc Networks and Smart Cities. Why do some games win awards and others don't? After entering the industry just 2 years ago our game Blockships has won 6 awards and 6 nominations. We've taken it to over 20 events, expos, and conferences along the way, appeared in the PAX10, on Ginx TV, and the front page of Twitch. Were we just lucky? No, then, are we simply amazing? No, and in this talk I will discuss how we won these awards, and our strategy for getting them. What we did right, what went wrong, and how you can use what we learned to improve your ability to gain awards and how to make the most of them when you win!